Barbaro (April 29, 2003 – January 29, 2007) was a Thoroughbred racehorse from Pennsylvania, mostly famous for decisively winning the 2006 Kentucky Derby. He was bred and owned by Gretchen and Roy Jackson’s Lael Stables in West Grove, a borough in Chester County, Pennsylvania, USA. Barbaro’s very first race took place at Delware Park in Wilmington, Delaware on October 4, 2005. It was a 1-mile Maiden race on turf, and conditions were firm. Barbaro won this race, and it would prove to be the start of a 6-race long winning streak, where the ultimate win was the Kentucky Derby victory on May 6, 2006. In his next race after the Kentucky Derby, the 2006 Preakness Stakes, Barbaro suffered a horrific injury to his hind leg which broke in more than 20 places. He recieved extensive medical care by equine experts and for a few months it looked as if he would pull through, but in January 2007 he was euthanized after developing severe laminitis in all three non-injured legs and therefore having no foot that he could comfortably put weight on. Barbaro participated in five races prior to the Kentucky Derby, and he won all five of them. The 2006 Kentucky Derby had a full field of 20 horses, and among the puntors, Barbaro was the second-choice to win, with the odds of 6:1. His jockey was the Peruvian-born American jockey Edgar Prado, who in 2004 had become the 19th jockey in thoroughbred racing history to win 5,000 races. During the last turn and straightway of the race, Barbaro charged head. His lead expanded in the final furlong, even though Prado wasn’t using the whip. Barbo won the race, and he won it with a magnificient margin – six and a half lenghts ahead of the second finnisher Bluegrass Cat! This margin of victory was the biggest one since the famous Triple Crown winner Assault won by 8 lenghts in 1946. 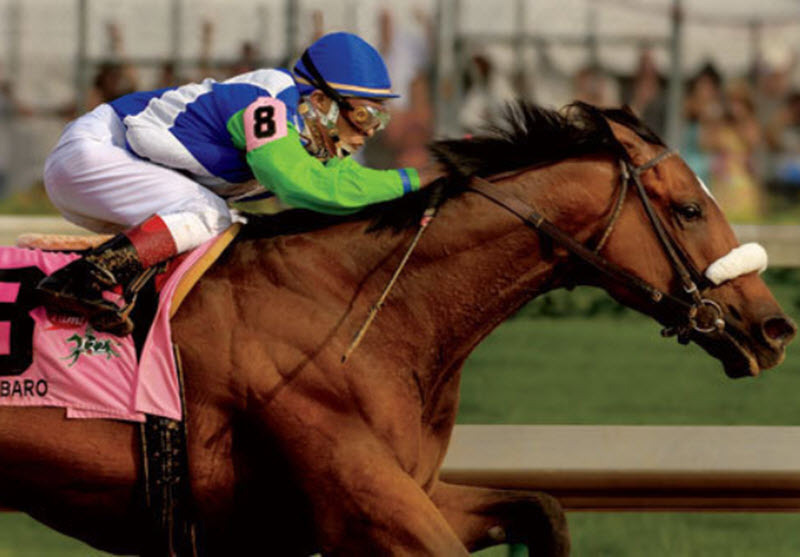 When Barbaro won the 2006 Kentucky Derby, he became the 6th undefeated horse ever to win this prestigious event. Barbaro was also un unsual winnner in that he hadn’t been particapting in any races at all for five weeks prior to the Kentucky Derby. This was the longest layoff in half a century for a Kentucky Derby winner. At the Preakness Stakes, Barbaro did a false start by breaking from the starting gate prematurely. Upon being reloaded into the gate, he was deemed fit to particate in the race. As the restarted race commenced, Barbaro broke cleanly, but as the horses passed the grandstand – shortly after the start – he suffered a horrible and devasting injury to his right hind leg. There has been a lot of speculation about how and why this could happen, but no conclusive explanation has been offered. Edgar Prado immediately pulled Barbaro up and brought him to a gentle stop, before rushing out of the sulky to lean his shoulder into Barbaro’s shulder to support the horse as they waited for track attendants to arrive to the scene. Afterwards, Prado was visibly moved, and declined to give any comment. Later, he has been complimented for his quick action on the track, as it probably contributed to Barbaro not having to be euthanized there and then. A medical investigation revealed that Barbaro’s right hind leg was broken in more than 20 places. A cannon bone was broken above the pastern, a sesamoid bone was broken behind the fetlock, and a long pastern bone was broken below the fetlock. Also, the fetlock joint was dislocated, leaving Barbaro’s foot dangling loosely. Unlike light-weight animals such as many dogs, a horse can usually not survive long with only tree functioning legs since having to carry all weight on tree legs tend to lead to serious health issues in one or more of those legs. In an effort to save Barbaro’s life, the equine surgeon Dr. Dean Richardson and his surgical team at University of Pennsylvania’s New Bolton Center in Kennett Square peformed a fusion of the fetlock and pastern joints the day after the race, hoping that the leg would become strong enough for Barbaro to put weight on. During the five-hour long surgery, a Synthes stainless steel locking compression plate and 27 screws were inplanted into the leg, and a fiberglass cast was placed over the plate to protect it. After the surgery, Barbaro was put into a recovery pool. As he woke up from the anesthesia, he stood on all four legs, and then walked at a suprisingly quick pace to his stall. He ate and he didn’t seem to be uncomfortable putting weight on his injured leg. The first week after surgery went well, but in the first week of July complications ensured and Barbaro displayed signs of problems in both his hind legs. An abscess developed in the (non-injured) left foot and the infection made the horse feverish. By July 13, Barbaro was suffering from severe laminitis in the left hind hoof. Drastic measurres had to be taken, and hoof wall resection was carried out which removed 80% of the left rear hoof. Now, both rear legs were in casts, and Barbaro was given a special support boot for the left hoof. A support sling in his stall made it possible for him to stand without putting weight on his hooves. On August 8, an examination showed that the broken right hind leg was healing nicely, and his left hind hoof was also showing signs of improvement. On August 15, it was reported that Barbaro had been allowed to graze outdoors for the first time since the accident. On August 17, he was no longer using the support sling in his stall. Through autumn, Barbaro kept on healing, under the watchful care of the equine vet specialists. On November 6, his cast could be removed and replaced with a splinted bandage. On December 12, this bandage could be removed permanently. In early January 2007, Barbaro’s laminitic left hoof developed problems again, and a section of it was removed surgically on January 10. The cast was put back on his right hind leg to provide support, and the support sling was back in use. To complicate things further, an absess appeared in his right hind foot, probably due to a lack of grip exercise. Surgery was carried out on January 27, but later the same weeked, Barbaro’s front feet – which had remained remarkably healthy ever since the accident in June – began to show clear symptoms of liminitis. Now, Barbaro could not comfortably put weight on any of this four legs. His owners, Roy and Gretchen Jackson, didn’t want him to suffer more and decided to have him euthanized. He was euthinized at January 29, 2007 and his body cremated shortly thereafter. Barbaro’s remains were interred near an entrance to Churchill Downs. The spot was purposly outside the Churchill Downs and the Kentucky Derby Museum to make it possible for his fans to visit his gravesite without having to pay any entrance fee. 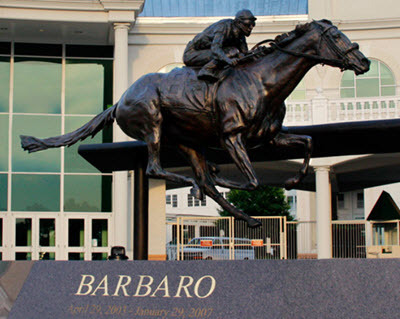 A bronze statue in Barbaro’s honor was created by Alexa King, and unveiled at Churchill Downs in April 2009. The Turf Publicists of America voted to give Dr. Richardson the Big Sport of Turfdom Award for his tireless efforts to save Barbaro. A large anonymous donation made it possible for the New Bolton Center to establish the Barbaro Fund to aid the treatment and care of large animals. The Gulfstream Park established scholarships to the University of Florida for fourth-year students in Veterinary Medicine and graduate students in equine veterinary research. The Jacksons endowed a chair for equine disease research at the University of Pennsylvania’s veterinary school. The National Thoroughbred Racing Association (NTRA) established the Barbaro Memorial Fund for Equine Health and Safety. Among other things, resources will be devoted to the study of laminitis. The Sir Barton Stakes at Pimlico Racecourse was renamed the Barbaro Stakes. This race is a part of the Preakness Stakes Day undercard. The Leonard Richards Stakes at Delaware Park Racetrack was renamed the Barbaro Stakes. This is a Grade III race for three-year-olds.